Odisha Public Service Commission (OPSC) has released a Latest Govt Job recruitment notification for 1,950 posts of Assistant Surgeon. Interested candidates may check the vacancy details and apply online from 10-01-2019 to 31-01-2019. Educational Qualification: Candidates should have passed MBBS recognised by the Medical Council of India and have a valid registration certificate under the Odisha Medical "Registration Rules 1956". Application Fee: General/OBC candidates have to pay Rs. 500 through online mode using Net-banking/Credit or Debit Card. SC/ST/PH candidates don't have to pay any fee. 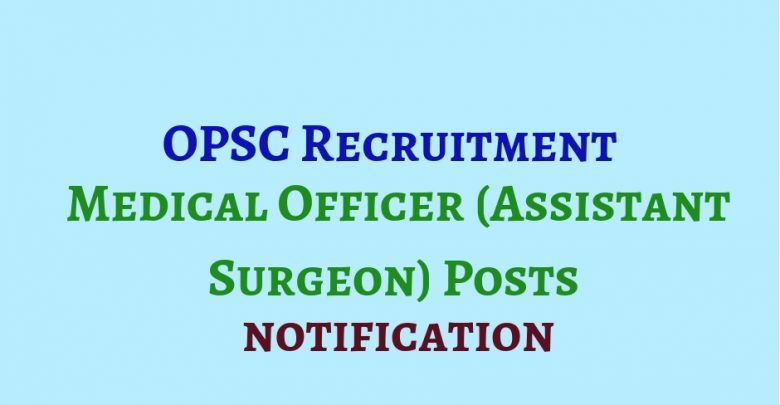 How to Apply: Interested and eligible candidates may apply online through OPSC website - http://www.opsc.gov.in/ - from 10-01-2019 to 31-01-2019.